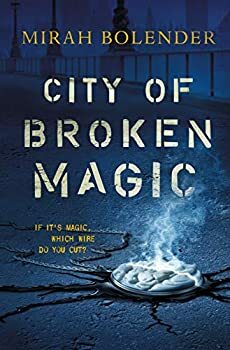 Mirah Bolender’s debut novel, City of Broken Magic (2018), is an enjoyable book, with an interesting magical system and a main character, Laura, who matures as the story progresses. Physical descriptions of the city of Amicae, where Laura lives, and the various settings for action sequences, are nicely done. I’d recommend this book for a long, rainy afternoon, or a snow day — it’s an entertaining way to spend a few hours. Laura Kramer is an apprentice Sweeper. Sweepers deal with the “monsters” who infest the broken or drained magical amulets everyone in the city (and all neighboring cities) use. The monsters eat magic; magic is in everything, including people, which means they eat us. Laura is the main Sweeper’s, Clae Sinclair’s, senior apprentice and his only apprentice. They are the only two municipal Sweepers in a city that used to be known as the Sweeper’s City. Later, Clae takes on Okane, another apprentice, but the City Council and other politicians have convinced the people of Amicae that the monsters are not a serious problem. The city has built a wall around itself, and the rising number of monster infestations are publicly blamed on mob activity. If you’re seeing some parallels between modern life and this fantasy, then you are paying attention. While it is easy to see why, in our world, the people in power wish to deny global warming (short-term profits) it’s never quite as clear in The City of Broken Magic why the powers-that-be have lied so thoroughly about a real threat that also damages their bottom line, but that’s the set-up of the story. Monsters are fought using a semi-self-aware magical substance called kin, which is in part made from a magical stone called Gin. Clae distills kin himself, and it is used in bullets and grenade-like weapons called Eggs. Periodically, Clae and Laura made the rounds of the city to pour a preventive dose of kin into the large shafts called Pits which hold infected amulets, to keep the infestation from taking hold. Think of it as applying a drain cleaner on a regular basis. Part of the plot for City of Broken Magic comes from a tycoon’s desire to drill his sewer line expansion through one of the Pits. 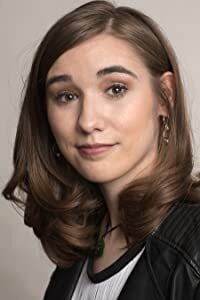 Laura is a young woman who is working at a job that is traditionally not appropriate for women; Aunt Morgan, who raised her, tries desperately to marry her off. Morgan herself has a daughter out of wedlock and tries to ignore the jibes and whispers of their neighbors. Laura has a gift for magic that she does not recognize, but Clae does. She is unsure of herself and becomes fearful and jealous of her position when Clae takes on Okane. Watching Laura grow, and reach out to Okane, teaching him even though she fears he will supplant her, was a pleasure. City of Broken Magic suffered from some structural difficulties and the baffling behavior of the mysterious and acerbic Clae. Clae withholds valuable information from Laura regularly, for no reason. He also withholds things about his personal life, which makes sense as we learn more, and some Sweeper-related information for the time-honored plot-driven reason that he doesn’t think she’s ready. And some stuff there is no reason not to share. For instance, Clae regularly takes Laura to look at a really pretty tree. He inspects its roots. Why? He doesn’t say. Much later in the book, the reason is revealed. There’s no reason he wouldn’t have told her the first time they went there. Every plot point in the story was easily predicted. Particularly, a bad train ride out of the city went so spectacularly wrong, with such a series of interlocking bad coincidences, that I waited for the architect of that act of sabotage to be revealed, but they never were. There are regular battles with the monsters, which, until the end, seem to be there mostly to juice up the tension and drama. Clae says the attacks are spiking or will spike, but we never exactly see a spike until the very end. The people of the city of Rex appear in the story with no foregrounding and are another group whose motivations aren’t clear. Despite that, City of Broken Magic was fun to read. Laura’s use of her own amulets to provide mild super-hero powers (like floating, if not actual flying) was a delight. I’m sure fans will look forward to book two, The Monstrous Citadel, due out in November 2019. I anticipate watching how Laura and Okane evolve, and maybe some of my questions will be answered. Published in November 2018. Mirah Bolender’s fast-paced, adventure fantasy debut, City of Broken Magic, features a bomb squad that defuses magic weapons. Five hundred years ago, magi created a weapon they couldn’t control. An infestation that ate magic―and anything else it came into contact with. Enemies and allies were equally filling. Only an elite team of non-magical humans, known as sweepers, can defuse and dispose of infestations before they spread. Most die before they finish training. Laura, a new team member, has stayed alive longer than most. Now, she’s the last―and only―sweeper standing between the city and a massive infestation.